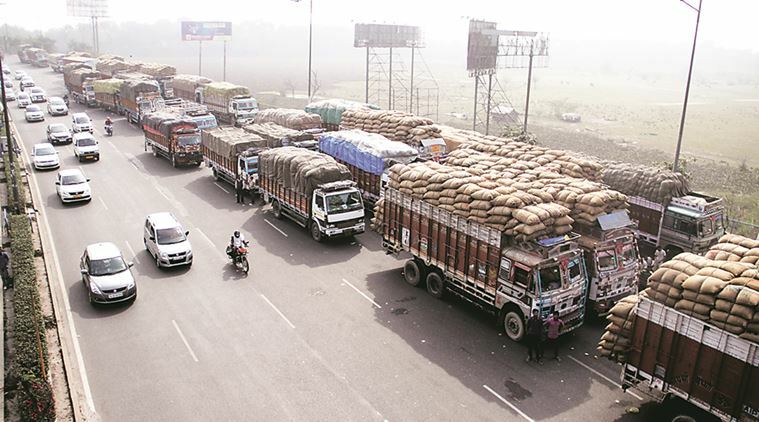 In a bid to ensure that overloaded vehicles are not able to enter the state, the Uttar Pradesh government is also mulling to study the “Gujarat pattern”, UP Transport minister Swatantra Dev Singh said without elaborating. For the first time in UP, the state government has been able to curtail it, and nearly Rs 16 crore recovered from overloaded vehicles. As part of measures, the government has taken action against 18,112 overloaded heavy vehicles, and recovered Rs 23 crore as fine. In a bid to ensure that overloaded vehicles are not able to enter the state, the Uttar Pradesh government is also mulling to study the “Gujarat pattern”, he said without elaborating. “Overloading has never been brought under complete control. For the first time in UP, the state government has been able to curtail it, and nearly Rs 16 crore recovered from overloaded vehicles,” he said. “The Uttar Pradesh government will seek the usage of digital and satellite technology to get rid of the menace of overloading,” he said. The heavy fines on overloading has led to improved earnings for the Uttar Pradesh State Road Transport Corporation which has reported a profit of Rs 14 crore from the Rs 10 crore earlier. He said the department is resolving close to 100 complaints on a daily basis, which pour in from different social media platforms including Twitter and Facebook. Elaborating on initiatives taken by his ministry, the minister said his department has developed an app to check the exact status of buses. “For the first time, people of the state will be able to know the exact position of the bus in which they intend to travel, as we have started online tracking of buses. The department has developed an app so that passengers can know the exact status of their buses at a single touch. The app is called Track Your Bus. It also gives passengers the option of booking seats,” the 57-year-old minister said. Singh said UPSRTC has also developed and implemented the Automated Fuel Management System in 73 depots of the state. “This has strengthened diesel storage and distribution mechanism, and at the same time ended possibility of diesel theft,” he said. “Toll payment by UPSRTC buses at toll booths on national highways is being done through RFID (Radio Frequency Identification) fast tags. This saves precious time of passenger and valuable fuel of buses,” the minister said, while pointing to the achievement of the department in the past 100 days. As many as 63 bus stations in 54 districts are now getting benefits of free Wi-Fi facility. “Gradually, benefits of free Wi-Fi will be given to passengers travelling in buses. Apart from this, sanitation and toilet facilities at different bus stations have been spruced up, and water ATMs installed at six bus stations in Varanasi, Allahabad, Azamgarh, Moradabad, Rampur and Hardoi,” the minister said. Buses of the UPSRTC are now plying through 3,725 villages, which were till now deprived of bus connectivity. E-challan has been launched, and provisions have been made so that e-payment of the fine can be made by the vehicle owner, he said. Singh said the recent agreement between transport departments of UP and Rajasthan will benefit 3.5 crore passengers. “Similar agreements are likely to be inked with other states such as Bihar, Haryana, Punjab, Jammu and Kashmir, Jharkhand, Madhya Pradesh, Delhi and Uttarakhand,” he said, and added that the endeavour of the state government is to strengthen rural transportation and connectivity. “This will enable us to realise the vision of Pandit Deen Dayal Upadhyay and Antyodaya (which aims at ensuring that the benefits reach the last man of society),” the minister said. “Places of religious importance in Bundelkhand, which do not have a direct rail link with Lucknow, will be linked with buses. This will be done with other such religious places of the state as well,” Singh said. The UP transport minister said bus drivers, who have a good track record of accident-free journey will be awarded. “In addition to drivers, department officials and their children will also be awarded,” he said and added that free check-up camps will be held from July to September. On the menace of bus drivers talking on the phone while behind the wheels, the minister said the government has asked passengers to click pictures of such drivers, send their pictures through WhatsApp to it, and win cash prizes. A fine is also imposed on the errant driver. The minister said the initiative has elicited an encouraging response.